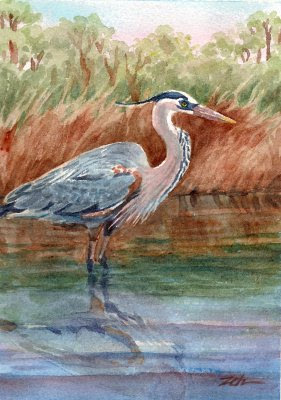 It's early spring and the Great Blue Heron is looking fine in its breeding plumage. Grasses line the pond, still golden from the long winter. The trees are in their spring green colors. It's not that far away! Yesterday when I was walking in the Nature Preserve, I heard red-winged blackbirds calling at this pond.